Anyone can invest online, but without the right guidance and know-how, a well-meaning online investment can go wrong—fast. Inside, you'll find the investment strategies you need to pick a winning strategy, find an online broker, and build a successful investment portfolio. This friendly and easily accessible guide bypasses confusing jargon and points you toward the most helpful websites, online calculators, databases, and online communities that will help you succeed in the stock market. 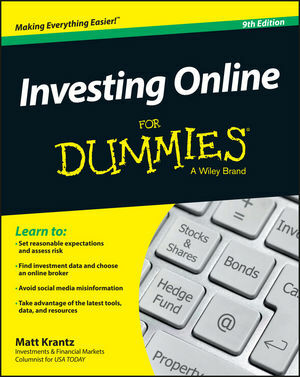 Updated to cover the latest tools of the trade, this new edition of Investing Online For Dummies offers expert online investing advice that you can take to the bank! From setting reasonable expectations, figuring out how much to invest, and assessing appropriate risks to picking an online broker and finding investment data online, this power packed book sums up everything you'll encounter as you invest your way to hard-earned financial success. Don't take a risk on the wrong tool or strategy. Investing Online For Dummies features a stockpile of powerful, effective resources to help you build an impressive portfolio. Matt Krantz is a nationally known financial journalist who specializes in investing topics. He has been with USA TODAY since 1999, covering financial markets and Wall Street. Matt concentrates on developments affecting individual investors, and writes a daily online column, "Ask Matt."